You are here: Home / iTS OUR BLOGS / leadership / Why scream at empty vessels? Why scream at empty vessels? Well he’s done it again! Marshall Goldsmith has written a fantastic short blog which is spot on…those of you who are getting your heads around the 3 Principles will surely see how this resonates with how our “thinking” creates our “consciousness” (our experience of the world). Enjoy the read and watch out for those empty vessels! A young farmer paddled his boat vigorously up river. He was covered with sweat as he paddled his boat upstream to deliver his produce to the village. It was a hot day, and he wanted to make his delivery and get home before dark. 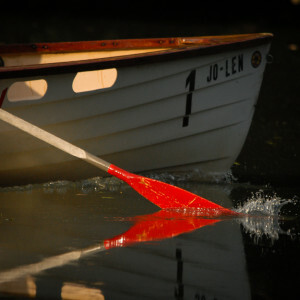 As he looked ahead, he spied another vessel, heading rapidly downstream toward his boat. He rowed furiously to get out of the way, but it didn’t seem to help. As he glared into the boat, seeking out the individual responsible for the accident, he realised that there was no one. He had been screaming at an empty boat that had broken free of its moorings and was floating downstream with the current. The interesting thing is that we behave one way when we believe that there is another person at the helm. We blame that stupid, uncaring person for our misfortune. We get angry, act out, assign fault, and play the victim. In other words, we are not engaged in a positive way for ourselves, but in a negative and defensive way that makes nothing better! We behave more calmly when we know that what is coming towards us is an empty boat. With no available scapegoat, we don’t get upset. We make peace with the fact that our misfortune was the result of fate or bad luck and we do our best to rectify the situation. We may even laugh at the absurdity of a random unmanned boat finding a way to collide with us in a vast body of water. 2) change what we can change. It is up to us to choose how we react to the empty boats in our lives. We can either yell and scream at the empty boats and endure the collision or choose to get out of the way the best we can, accepting what happens, and do our best to continue on our way along the river.